Jagdgeschwader 54 (JG 54) Grünherz (Green Hearts) was a Luftwaffe fighter wing during the Second World War. It was known as the Green Hearts Wing, and it was the second highest scoring wing of all time, JG 52 being the highest. Jagdgeschwader 54 (JG 54) Grünherz (Green Hearts) was a Luftwaffe fighter wing during the Second World War. 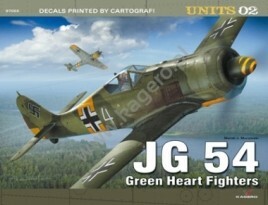 It was known as the Green Hearts Wing, and it was the second highest scoring wing of all time, JG 52 being the highest. JG 54 flew on the Eastern Front, racking up over 9,600 kills, with aces such as Walter Nowotny, Otto Kittel, Freiherr Peter Grunhertz, Hans "Phips" Philipp, Gunther Lutzow, Emil "Bully" Lang (Lang holds the record for most kills in a day,18), Max-Hellmuth Ostermann, Dietrich Hrabak, Werner Schroer and Hannes Trautloft being the most famous Experten.